The flagship L.L. Bean store in Freeport recently. Jim Witherell of Lewiston, who wrote "L.L. Bean: The Man and His Company," is seen recently. One of many display cubes throughout the store in Freeport featuring L.L. Bean products from the past. One of two hangers used in L.L. Bean's Auburn store. Down the street from the flagship store in Freeport sits the house were L.L. 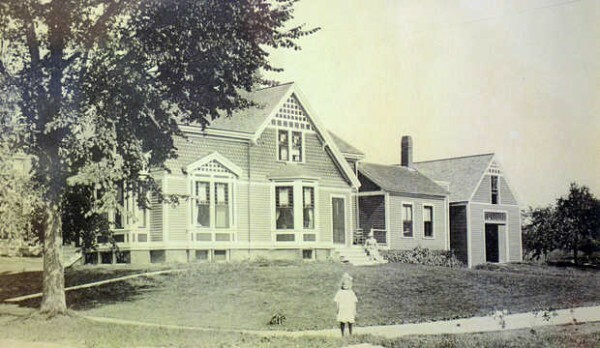 Bean lived with his wife (sitting on the porch) and his youngest daughter in this undated photo in the L.L. Bean archives. 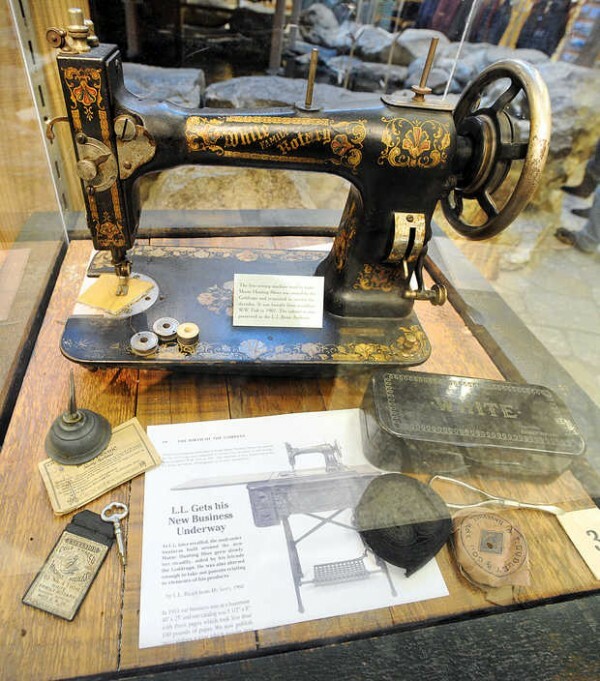 The sewing machine used to make the first pair of Bean boots is seen in this display cube, one of many throughout the store in Freeport featuring L.L. Bean products from the past. Inside the L.L. Bean store in Freeport recently. 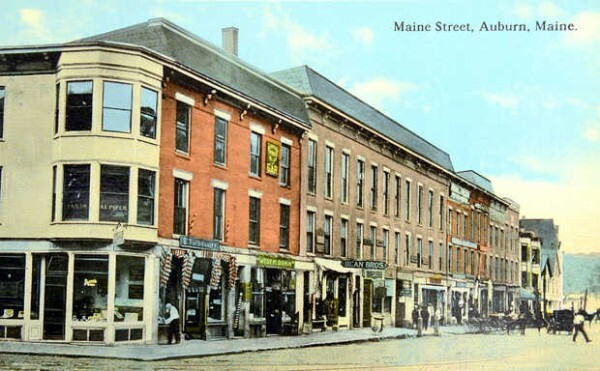 An old postcard shows the Bean Brothers clothing store on Main Street in Auburn, the current site of Gritty's Brew Pub. FREEPORT, Maine — In the rear of a plain-looking white house — not far from the crush of shoppers at L.L. Bean’s retail complex — reside the relics of the company’s century-long history. Racks of vintage wool coats hang alongside antique fishing poles and knapsacks. L.L. Bean-brand dinnerware sold in the 1950s is here. So are the original paintings used for the covers of Eisenhower-era L.L. Bean catalogs. But the oldest mementos in this temperature-, humidity- and light-controlled haven aren’t from Freeport. 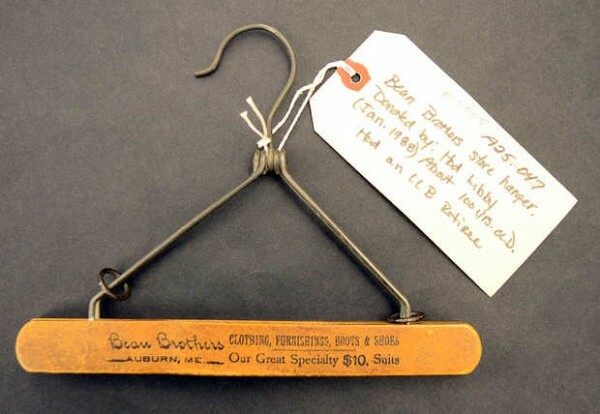 The hangers date to somewhere between 1902 and 1905, before Leon Leonwood Bean created his catalog, his 100 percent guarantee or his Maine hunting shoe. At a time when the L.L. 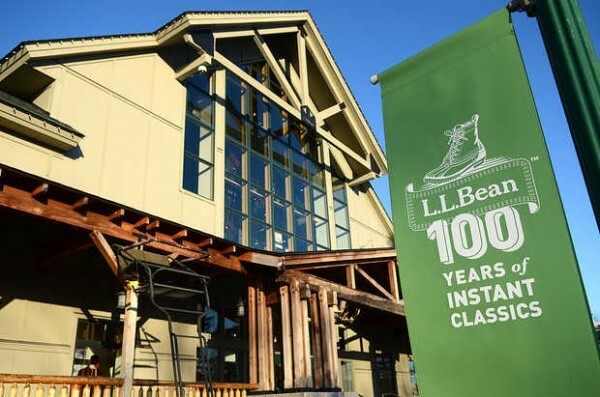 Bean company is celebrating its centennial with product giveaways, concerts, a $1 million donation to the National Park Foundation and even a drivable boot with a Ford engine, people are rediscovering that L.L. 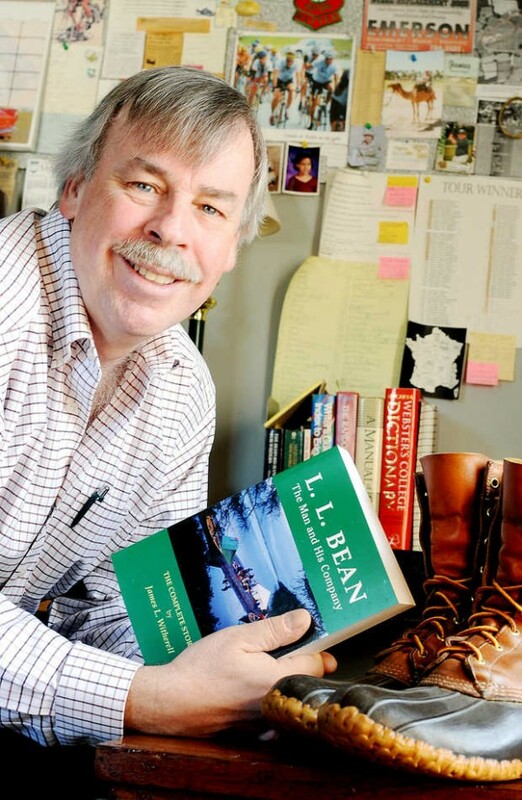 Bean, the man and the retailer, had roots in western Maine. The guy who proudly told folks — “I do not consider a sale complete until goods are worn out and a customer is still satisfied” — was born on Howe Hill in Greenwood on Oct. 13, 1872. The Civil War had been over for only seven years and the governor of Maine was Sidney Perham from nearby Woodstock. Bean was the fourth of six kids. By the time he was 8, his parents, Benjamin Warren Bean and Sarah Swett Bean, had moved the growing family to a farm in Bethel. It was idyllic for a while. 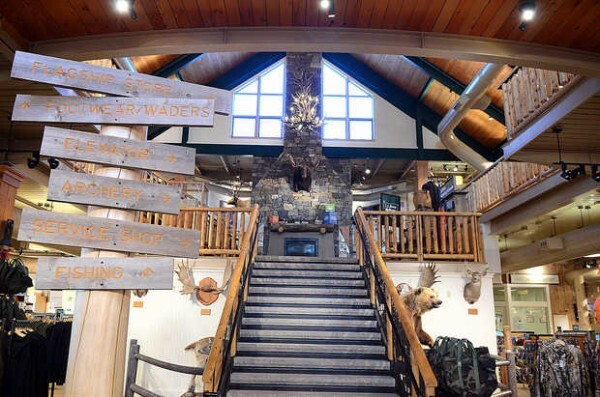 Even then, Lennie, as he was commonly known, demonstrated a love of the outdoors that intersected with a desire to make money, Witherell said. “There’s a story about a fair L.L. wanted to attend,” the author said. Lennie chose the traps, figuring he could catch minks, muskrats and foxes and sell their pelts. Soon, the quiet boyhood ended. Shorty after his 12th birthday, his father died. Four days later, his mother died. Witherell said he never found out how the couple died, only that Bean’s dad had been sick for a while. Now an orphan, Bean went to live with his mother’s brother in South Paris. He went on his first hunting trip at 13, following his cousin “Louvie” to the Wild River area of New Hampshire. He shot his first deer with a borrowed rifle. 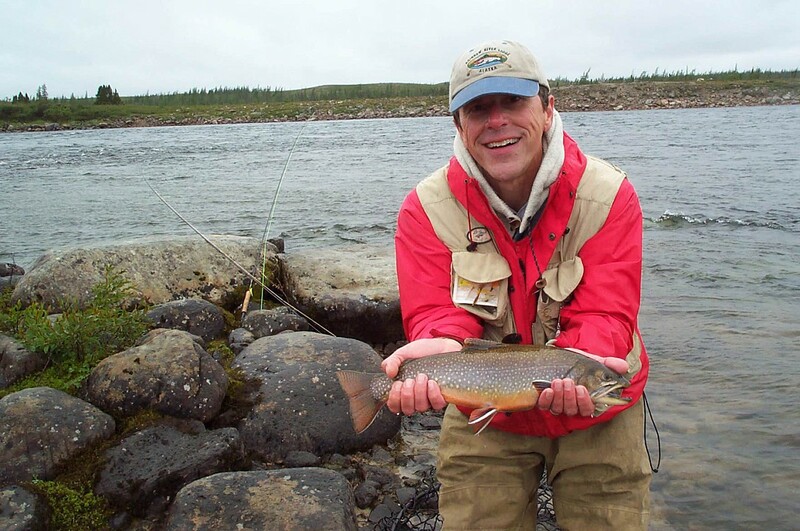 “He became a true outdoorsman,” Witherell said. A year later, he sold his second deer and used the money to stay in the woods for a week. For the rest of his life, hunting was a priority. When he was 15, he went to live with another Uncle in West Minot, who paid him $12 a month to work on his farm. By his late teens, Bean had spent a semester at Hebron Academy and at 18 went to Kents Hill Academy in Readfield. He paid his own way through school, first selling soap and then working in a Bangor butter factory to make enough money, Witherell wrote. After graduation in 1893, he went to work for his brother Otho, who ran a shoe store in Yarmouth. It would be another 19 years before he had a company of his own, built on the shoe he invented to protect his feet while hunting. Ruth Porter, who runs the L.L. Bean archive, said Bean was learning about being a merchant by working with his brothers. “Otho sent him here to Freeport because he’d opened up a store on Main Street,” she said. “That was more of a haberdashery and not just shoes. Irvin and Bean ran that store over here. They were all brothers. Then, Bean went up to Auburn to try to make a little bit more money. A postcard from the era pictures the sign “Bean Bros” on the Main Street storefront. The property is now occupied by Gritty McDuff’s Brew Pub and Restaurant. Bean’s own work in Auburn didn’t last long. By 1905, he returned to Freeport to stay. Seven years later, he invented his boot. The story of its invention is the stuff of legend. One night after returning home from a day of hunting, Bean complained that his feet were wet and cold. A solution was needed. He decided to combine the waterproof bottoms of galoshes with the leather uppers from boots. Bean hired a local leather cutter and his wife cut the leather uppers and sewed them, Porter said. For the rubber bottoms, he took galoshes off the shelf at his store. A local cobbler assembled the pieces. As the L.L. Bean Company, he sold all 100 pairs from his first batch. But they were faulty. The rubber from the galoshes wasn’t sturdy enough. Though it was costly, Bean returned everyone’s money and went to work to improve the boots. He quickly hired U.S. Rubber in Boston to make the bottoms, Porter said. The Maine Hunting Shoe soon proved hugely popular. Its fans would come to include celebrities as varied as baseball greats Babe Ruth and Ted Williams to World War II General Omar Bradley. 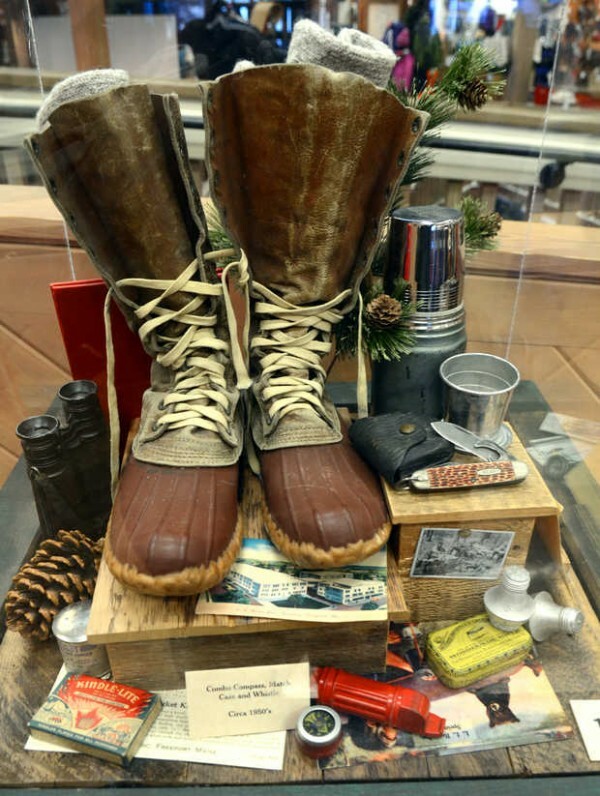 Memorabilia from all three are on display in the massive Freeport retail store, a few steps from the spot where the boots are still sold. Though they have been refined over the years, they are clearly recognizable. And there remains a local connection. Though the leather work and stitching on the boots happens in a factory in Brunswick, the rubber bottoms for every Maine Hunting Shoe are made in a small factory on Westminster Street in Lewiston. Together, the factories produce 1,500 pairs a day. If Bean were still alive — he died in 1967 at the age of 94 — he’d be proud of the company, Witherell said. He might also be puzzled by its growth, particularly in the 1980s and 1990s under the guidance of his grandson, Leon Gorman. And without the shoe, it’s unlikely Bean would have become such an icon, Witherell said. “He would have probably gone on working in little men’s stores with his brothers and passed on relatively unnoticed, except for that great idea that he had,” Witherell said. But Porter figures Bean was too inquisitive to have gone unnoticed. He consistently updated his products, tested them for the early catalogs that he wrote himself and continued to invent. Among his creations was a simplified method of scoring baseball games. The die-hard Red Sox fan was a season ticket holder at Fenway Park. He bought seats for himself, a companion and their coats, Porter said. She talks about Bean in an almost present tense, as if they had lunch last Tuesday. Maybe it comes from her work on the archive. Or maybe it comes from the archive’s location in the back of that modest white house, the same house L.L. Bean and his family lived in.